What do coffee grounds look like when they come out of the filter? It probably looks like a tightly-packed clump. When they become wet, they clump together and will attach to other items in your disposal. They’ll stick to the blades of your disposal or the pipes and create a huge plumbing mess for Kansas City homeowners! Just do yourself a favor here and toss them in the trashcan every time! An alternative could be to put them in your garden, as they’ll act as an insect repellant! Extremely hard items can be a tough test for garbage disposals that usually results in a plumbing failure. When you toss any bones down the disposal, you run a massive risk of the blades chipping and possibly breaking altogether. If you happen to accidentally drop a chicken wing in there, don’t freak out! Chances are your disposal should be able to take care of it. Much more than that though and it could be time to panic! But they call it a “garbage” disposal, right?! Well, we didn’t invent the name, but from personal experience, it isn’t a wise decision to toss trash in your garbage disposal. 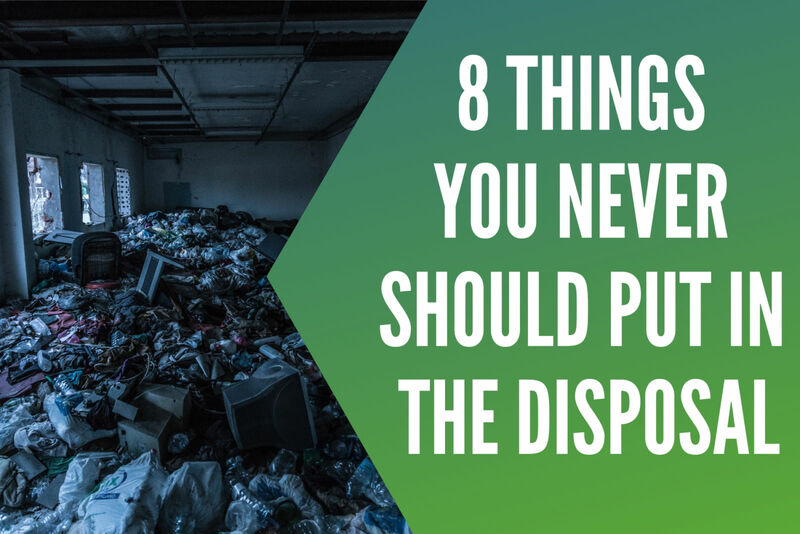 Whether it be a paper towel, bag, banana peel, you name it, we’ve seen them clogged up in a disposal! If you happen to toss one of those in, you’re probably going to find yourself Googling “Plumber Kansas City” soon after! Although it’s not fall right now, we thought it would be good to advise you not to stick any of those pumpkin guts in the garbage disposal. When you’re cleaning out the pumpkins in October for carving, just make sure to throw any of that in the trash can. The same methodology holds true for stringy, fibrous veggies like celery. What happens is those long strands tend to tie themselves around the blades and create a real plumbing mess! If you’re only peeling a few potatoes, you might be able to sneak by unscathed. It’s when you’re making a dish that requires more than a few that you run into plumbing troubles. They tend to hit the drain and act as a clog holding up other items dropped in the disposal. If you’ve ever made mac n’ cheese, you probably know that pasta expands when it gets wet. So, if you were to drop pasta into a disposal where it would sit in water, does that sound like a good idea? It will expand and instantly create a clog. As with some of the items on this list, a little bit won’t do too much damage. It’s when you’re dumping nearly a whole casserole down it that you run into issues! This might sound like common sense to most, but it’s something we’ve seen before. Since they aren’t easily washed away with water, they’ll cure and harden in your pipes and then just sit there. If you have to clean off any brushes, do it in a separate container. Wash out the paint with water until it’s almost completely clear. If you have a clog, it sounds logical to utilize some cleaning chemicals to clear it up. Not so fast! Dish soap is perfectly fine to go down the disposal, but drain busters or industrial-grade cleaners can do some serious damage to your disposal and sometimes the main line. In the end, these chemical drain cleaning products usually create a lot more problems than actual solutions. The logic here is pretty simple: the more that they’re used, the more it wears down your pipes. 👍What can I put in it then? As you can tell, garbage disposal clogs are one of the most common calls we get for plumbing in Kansas City. Obviously, some clogs are much worse than others, but the culprit is always the same: someone put something in their garbage disposal that they shouldn’t have. We don’t mean to hate on garbage disposals too much though! They can certainly be an excellent tool. Anything from small waste to non-toxic liquids to most fruits, you’re perfectly fine to use the disposal. Just be mindful of the items above. If you happen to accidentally put one of the “no-no’s” down your disposal in the Kansas City area, don’t hesitate to give us a call. We’ll be out as soon as possible and get the clog cleared up in no time. Keep in mind that most of the time it’s better to take care of this issue before it does further damage. Additionally, this is never a DIY project, so make sure to always hire an expert Kansas City plumber!